"How many people in Thames know what the memorial in Victoria Park is for, when it was erected and for whom? 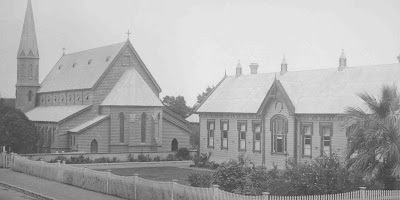 Today, old-timers who were present at the Central (Waiokaraka) School jubilee asked the "Star" about the fate of an old war memorial along Pollen Street. This is what they found out. 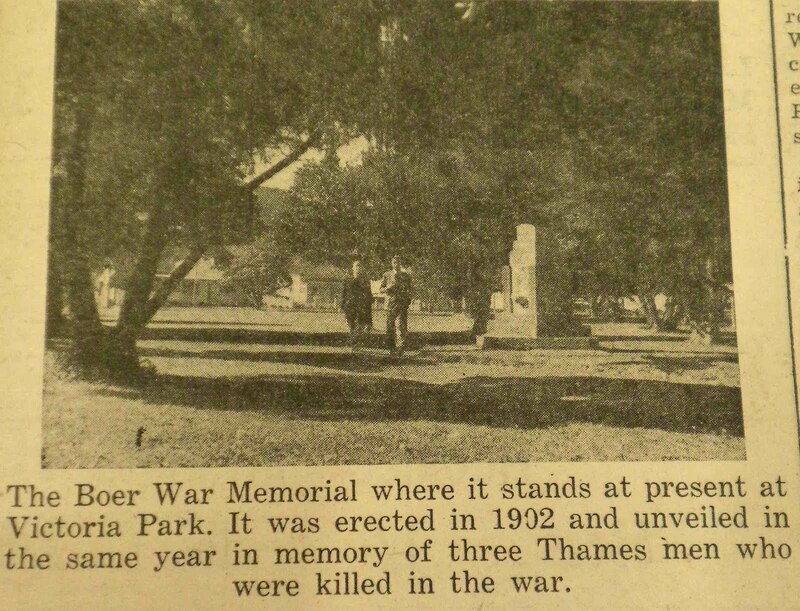 The memorial was erected in 1902 soon after the conclusion of the South African Boer War. in December of that same year it was unveiled by the Mayor Mr G Trembath, before a crowd of approximately 3000 people. It was erected by the residents of Thames Goldfields in memory of Fred W D Forbes, a gunner of the Fifth Contingent, Robert Farquhar, trooper of the H Squadron and William Donkin, trooper of the Seventh Contingent. Central Spot. The first resting place of the memorial was on the corner of Mary and Pollen Streets and an old resident explained this morning that it was by public request that it had been placed on that corner. The idea, he stated, was that for all those passing the street, which was when the centre of the town, to look at it and think of those who gave their lives in the "war at the turn of the century." 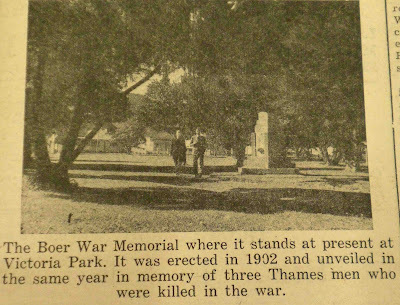 It is evident, however that there are few records kept of when the memorial was transferred from the centre of the town to Victoria Park where it now stands and in an interview with Mr Stan Danby this morning, he said that as far as he knew it was transferred between 1919 and 1920 as it was becoming a menace to traffic. A place was then needed to put this memorial and the only worthwhile spot was Victoria Park, well used at that period for band concerts. During the two years 1919-20 the transferring of the memorial took place and since then considerable care has been taken, by the bodies concerned with its upkeep, to keep it in a good state of preservation"
In the pre-1900s travel to Thames was principally by water, as the roads (tracks) were few and far between. The wharves of Thames and further along the rivers were kept busy with a large number of boats (of all sizes) bringing passengers and cargoes to the busy goldmining town. An excellent resource on the Northern Steamship Company that operated many of these ships that came to Thames is "The Servants of the North" by Cliff Furniss, 1977. For years the Thames playground has had a model of one of the most famous ships - the Wakatere. The picture below of the Wakatere, shows what a magnificent picture she must have been steaming down the firth. The paddlesteamer was built 1896 by Napier, & Bell, at Yoker in Dumbartonshire. The book noted above, records that the Wakatere was employed on the Thames run until 1926. Sadly suffering damage to the bottom of the ship from dragging over the shelly bottoms off the Thames. 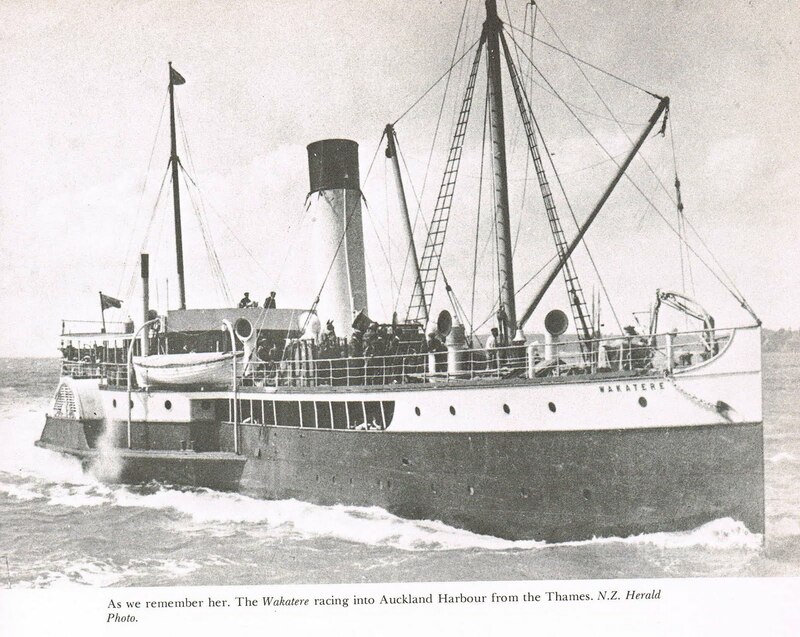 On the 16 December 1896, the maiden voyage took place of the Wakatere, from Auckland to Thames. The full report is at bottom of the page. There were 700 passengers and the voyage took 3 1/4 hours, which was deemed as being very impressive. There were many reasons that led to the decline of these services, but the constant silting of the Thames harbour area, always caused major problems given the tidal nature of the firth. What great days they must have been as the Thames wharves truly made Thames a very busy port of call. "The Wakatere racing into Auckland Harbour from the Thames NZ"
pg 115 "Servants of the North"
Continuing on the business theme, this would be one of favourite photos of early Thames. Maybe you had an ancestor that had a shop on the Thames,and imagine something like a corner dairy today. When the goldfields opened many shops were quickly opened to meet the needs of the rapidly growing town (as mentioned in previous article), many were merely shacks; with little in the way of interior space. 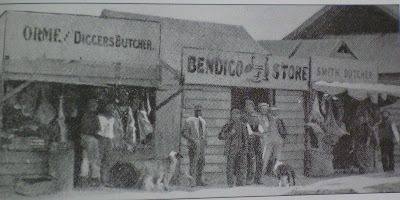 What a lively place it must have been - as shopkeepers walked the streets selling their goods; such as these butchers with the meat proudly hanging from the lean-to roof. Enter 'Thames' in the search box to see the selection of photos that extend from the Parawai/Kauaeranga area and Moanataiari to the south. On the surface you may think they are just another aerial photo but if you order a digital copy...you will soon see how special these photos are. You can literally take a tour around Thames and zoom in and out on streets and houses. 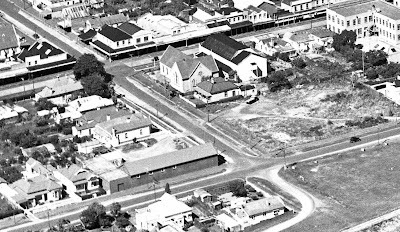 These photos combined with the 1946 Wises Street Directory (copy available at The Treasury), will allow you to work out more accurately where you/your ancestors lived. Below is a small example from the photo (resolution reduced) TH1-46 V C Browne & Son Thames 1947, photo no 21. Lots of info on the wider Thames area, including the Talisman Hotel at Katikati. Also in the "Our People" section there is an article on the Flu Epidemic of 1918 and Sister Jessie Linton who died while nursing patients during this epidemic. There are many newspaper reports outlining how serious the illness was in the Thames area and records of those who died. On Timespanner's blog are two wonderful articles on Thames. The second article is concerning a marriage that took place at the Karaka, Thames in 1896. The wedding between Ethel Margaret Redwood and Harry Ashby.